I want to thank everyone who has emailed me, and to say that I am going to reply to all emails, I simply haven’t been able to get through them all yet. I’m still trying to squeeze in some time amidst the chaos of unpacking to write about my Easter Vigil and Marriage Blessing experiences. In the meantime, I wanted to share this picture I took of the inside of our parish church just before the marriage ceremony. We’re lucky to be able to enter the Church in such a beautiful space. Wow, that is a beautiful church. I am jealous. My parish church has got to be the ugliest one I’ve ever been in. Sigh! Still, God is there. You may not have seen my query in another thread, but could you identify the parish? We’re building a new church and I’m interested in taking a closer look at your church building. Thanks! Anon – If you email me I’ll be happy to tell you which parish it is. I’m still planning on visiting sometime, I’ve only seen the church in person from afar while driving on the highway lol. That is a beautiful church Jen. Can you identify all the figures up front there? Jesus is in the center, but the four others to either side I can’t make out. Like the latin up top. Does you parish do Tridentine mass at times? What a beautiful place to come into the Church! God bless you! My brother-in-law’s wife and my brother and his wife are parishioners there; I and my two young daughters heard Mass there Easter morning. The building is what all new Church sanctuaries should aspire to be. 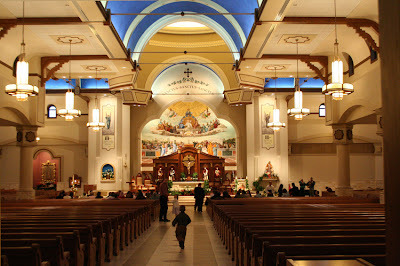 I wish I could attend Mass there weekly. I’ll avoid providing any identifying details about the parish since Jen seems to wish it to be that way. But to answer Mike J, it is the four evangelists who surround the Cross.